Bacteriology is the branch and specialty of biology that studies the morphology, ecology, genetics and biochemistry of bacteria as well as many other aspects related to them. 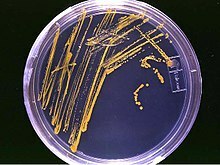 This subdivision of microbiology involves the identification, classification, and characterization of bacterial species. Because of the similarity of thinking and working with microorganisms other than bacteria, such as protozoa, fungi, and viruses, there has been a tendency for the field of bacteriology to extend as microbiology. The terms were formerly often used interchangeably. However, bacteriology can be classified as a distinct science. Bacteriology is the study of bacteria and their relation to medicine. Bacteriology evolved from physicians needing to apply the germ theory to test the concerns relating to the spoilage of foods and wines in the 19th century. Identification and characterizing of bacteria being associated to diseases led to advances in pathogenic bacteriology. Koch's postulates played a role into identifying the relationships between bacteria and specific diseases. Since then, bacteriology has had many successful advances like effective vaccines, for example, diphtheria toxoid and tetanus toxoid. There have also been some vaccines that were not as effective and have side effects for example, typhoid vaccine. Bacteriology has also provided discovery of antibiotics. The discovery of the connection of microorganisms to disease can be dated back to the nineteenth century, when German physician Robert Koch introduced the science of microorganisms to the medical field. He identified bacteria as the cause of infectious diseases and process of fermentation in diseases. 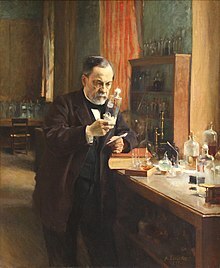 French Scientist Louis Pasteur developed techniques to produce vaccines. Both Koch and Pasteur played a role in improving antisepsis in medical treatment. This had an enormous positive effect on public health and gave a better understanding of the body and diseases. In 1870-1885 the modern methods of bacteriology technique were introduced by the use of strains and by the method of separating mixtures of organisms on plates of nutrient media. Between 1880 and 1881 Pasteur produced two successful vaccinations for animals against diseases caused by bacteria and it was successful. The importance of bacteria was recognized as it led to a study of disease prevention and treatment of diseases by vaccines. Bacteriology has developed and can be studied in agriculture, marine biology, water pollution, bacterial genetics and biotechnology. ^ Wassenaar, T. M. "Bacteriology: the study of bacteria". www.mmgc.eu. Archived from the original on 24 July 2011. Retrieved 18 June 2011. ^ Ward J. MacNeal; Herbert Upham Williams (1914). Pathogenic micro-organisms; a text-book of microbiology for physicians and students of medicine. P. Blakiston's sons & co. pp. 1–. Retrieved 18 June 2011. ^ Jeanne Stove Poindexter (30 November 1986). Methods and special applications in bacterial ecology. Springer. p. 87. ISBN 978-0-306-42346-8. Retrieved 18 June 2011.